The Pyeongchang Olympics are now a mere two months away, and Korea is due to get more attention than ever as a winter sports destination. But as any local skier or snowboarder knows, the biggest challenge at the nation’s slopes is avoiding the crowds. Want to get in on the action, but dodge the masses? The best way may be to hit the slopes at night. Konjiam is a luxurious resort in Gyeonggi-do run by the venerable LG Group. It’s the closest ski facility to the Seoul city center. 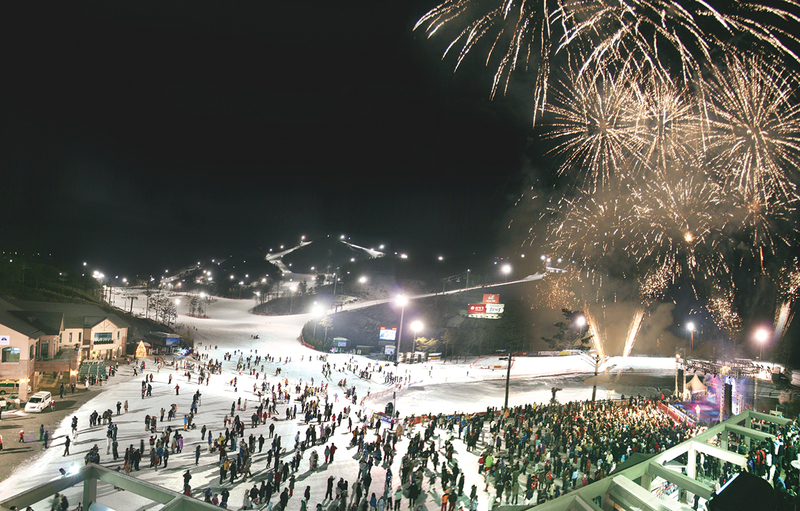 To cater to the evening crowd, the slopes are open until 4 a.m. every day of the week. Konjiam’s low altitude means the snow can run a little thin, but the fact that a subway will get you there in forty minutes makes up for it. In addition, admission is capped at KRW 7,000, guaranteeing more room to play for those who make it inside. Plus, the flexible “Me-Time” pass allows visitors to choose 3, 4 or 6 hour intervals without any set start or end time. There are also 20- and 30-hour passes for those who plan to ski only a few days out of the season. In addition to ski runs and a hotel, Konjiam also offers a “wellness spa” with lavish massages and skin treatments, a “family spa” with a heated indoor water park, and even a botanical garden. www.konjiamresort.co.kr | 1661-8787 | Take the Gyeonggang subway line to Gonjiam Station and board the resort shuttle bus at the exit. 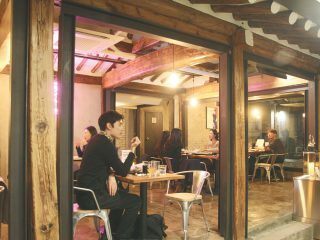 | Starts at KRW 29,000 for a one-hour Me-Time pass. Further from Seoul is Gangwon-do, whose Taebaek mountain range sees the country’s deepest snow. 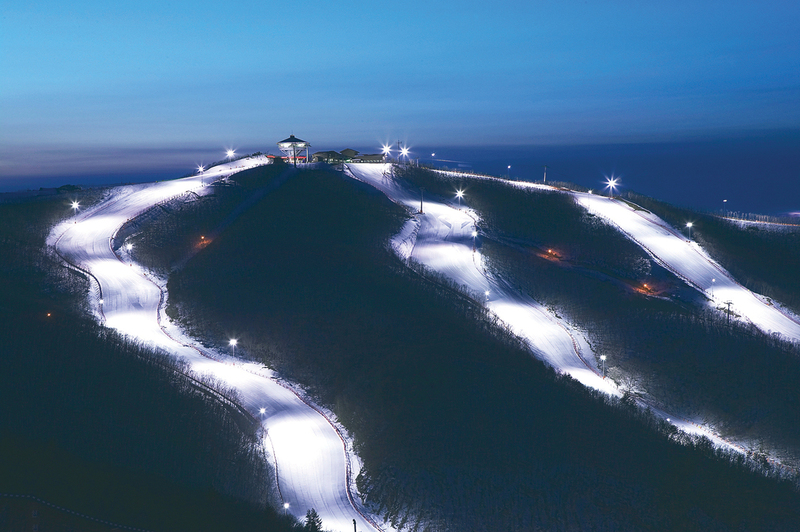 The combined golf-and-ski resort Elysian Gangchon lies – just barely – past the Gangwon border near the city of Chuncheon. Like Konjiam, it is subway – accessible. The long, wide slopes are open ‘til 3 a.m. on weekdays and 5 a.m. on weekends. Even low-level skiers and snowboarders can test their skills at eight out of ten of the runs, which are graded “intermediate” or below. The resort is also notably welcoming to foreigners, with ski instruction offered in English. Elysian also has a lounge specifically for night skiers, even those who only hold a regular one-day ticket. Night skiers can use the lounge to rest or nap from the hours of 10 p.m. to 6 a.m.
www.elysian.co.kr | 033-260-2000 | Take the Gyeongchun Line to Baegyangri Station | Starts at KRW 56,000 for a four-hour ticket, but there are discounts for everyone from government workers to couples, so check online to see what you can get. Like Elysian, Oak Valley is another resort that’s golf in summer, ski in winter. Located in the Gangwon city of Wonju, the resort is slightly under 1.5 hours from Seoul via train or bus. The wide runs, terrain park and relative lack of crowds make it popular among beginning to intermediate snowboarders. That, plus the fact that it’s open to 3 a.m. or later every day, means it’s perfect for after-dark snowboarding training. Oak Valley is also home to the stunning Museum SAN, a contemporary art space designed by world-renowned architect Ando Tadao and featuring a large permanent installation by artist James Turrell. Stop by during the day if you need a cerebral break from the nonstop action. High1 Resort has some of the best natural snow in Korea thanks to its elevation at 1,340 meters. On the flip side it’s a three-hour bus or train ride from the capital, and the slopes close at 10 p.m., meaning a day trip may be tough. 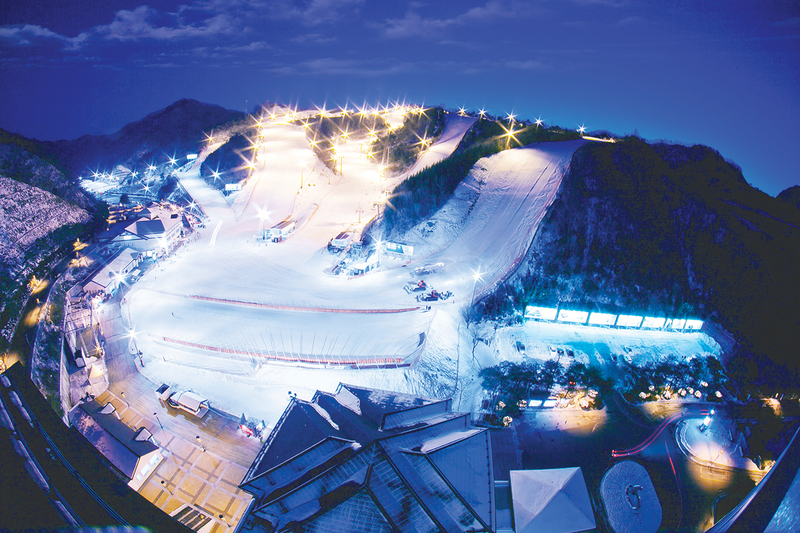 But in addition to evening skiing, the resort is known for its other nightlife attraction: Kangwon Land, the country’s only casino open to Korean citizens as well as foreigners. 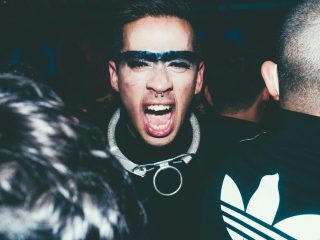 This, plus the quality of its slopes, means High1 makes our nightlife list. There are 18 ski runs ranging from a long and leisurely 4.2 slope for beginners to two slopes certified for the World Ski Championships. If you’re arriving late and staying only one day, passes for evening ski times plus the morning after offer the best value. www.high1.com | 1588-7789 | The fastest route is an express bus from Dong Seoul Bus Terminal to Gohan. There’s also a shuttle bus operated in English with reservations at www.purpleskibus.com. A KTX route from Wonju to Gangneung is set to open in December, further shortening the trip. | Starts at KRW 62,000 for a partial day pass (evening pass hours from 6 p.m.–10 p.m.) – but foreigners are eligible for big discounts, so be sure to take your passport.